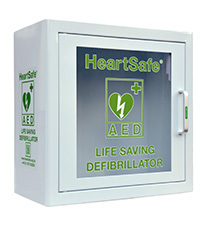 AbbeyLabels Ltd have recently purchased a HeartSafe Defibrillator Heart Restarter. Ellie Goffin (Compliance Manager) “We have been keeping our staff first aid training up to date. After completing the course various staff members suggested to me that in an emergency access to a defibrillator would be a good idea”. Sudden cardiac arrest can unfortunately strike at anytime and quick action with CPR and defibrillation is the only way to re-establish the heart’s natural rhythm. Ellie investigated where the location of the nearest machine could be found and noticed that not only is it some distance away but also the national database is incomplete . After receiving advice and the opinion of an experienced paramedic it was confirmed that if CPR and defibrillation is used for a Cardiac Arrest within three minutes the chances of survival can increase dramatically. I felt that the Heartsafe machine was the best choice for us as it came with a clear instruction offered the ability to talk novices through the process and Heartsafe also offered a comprehensive maintenance package. Although a lot of the staff at AbbeyLabels are trained first aiders the HeartSafe defibrillator can be used be a complete novice . The machine will instruct and talk you through the CPR defibrillation process by telling the users to connect the pads to a patient’s chest. The pads enable the defibrillator to examine the patient’s heart and determine if the patient is in a viable, shockable rhythm. It is a machine we never want to have to use but we are prepared should events arise. Ellie says we will be putting our defibrillator on the national database and we encourage other owners of defibrillators to do the same . The more machines that people are aware off the more chance that they could save a life.